As part of restoration of the San Elijo Lagoon in conjunction with improvements to Interstate 5, construction crews began pumping beach sand onto Fletcher Cove Beach on Saturday. Crews will pump 146,000 cubic yards of sand from the lagoon and place it on the beach. The work will proceed 24 hours a day and is expected to be completed in four weeks. 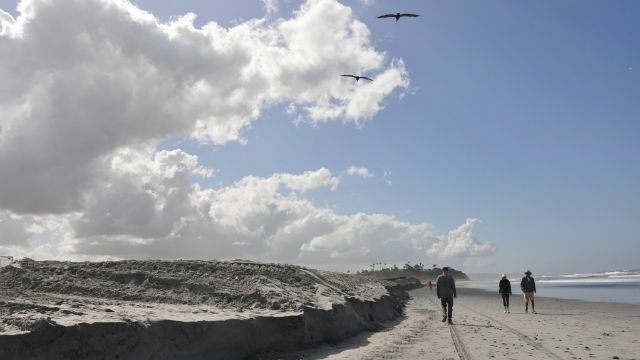 During beach replenishment, beach-goers can expect limited access around work areas and nearby residents and businesses in Solana Beach can expect intermittent noise and lights. The work is part of Build NCC, a collaborative effort between SANDAG, Caltrans and U.S. Department of Transportation. The project will extend carpool lanes on Interstate 5 to Route 78, double-track the rail line, replace the highway bridge across San Elijo Lagoon and restore the lagoon. Construction began in late 2016 and will be completed in 2021.